A desert in Europe? You won’t believe it, but there ARE deserts in Europe. One of the biggest sand drift areas in Northern Europe is in the Netherlands – the Dunes of Loon and Drunen National Park (Loonse-en-Drunense Duinen). The 30 km2 of shifting sands won this place among the locals the name Brabant Sahara. In this complete guide to Dunes of Loon and Drunen National Park you will find all related travel information you need to plan your visit. The Dunes of Loon and Drunen are one of the 20 National Parks in the Netherlands, together with De Biesbosch, the Dunes of Texel, De Meinweg and many more. 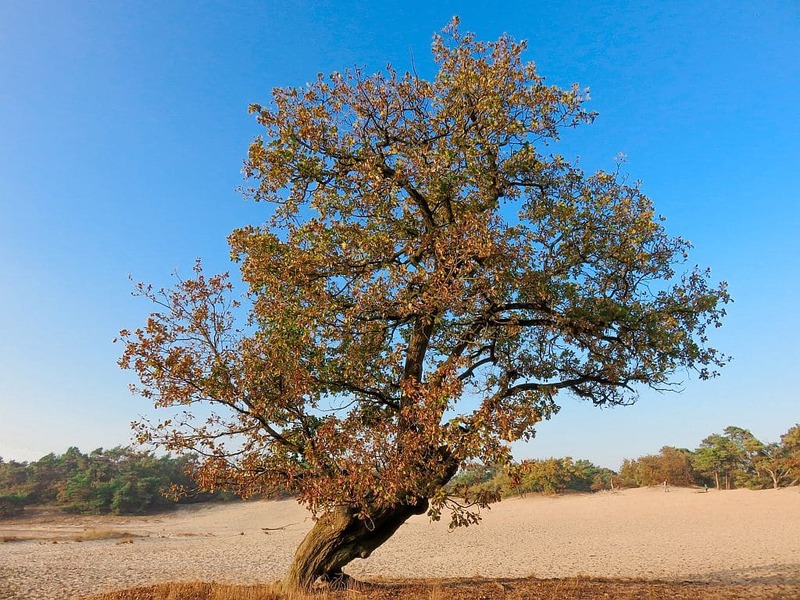 The name in Dutch is Loonse-en-Drunense Duinen and basically refers to the location of the park: the dunes between the small villages of Loon op Zand and Drunen. You might be also interested in reading about another national park in the Netherlands – De Biesbosch. In this article you will find information on how to get to the Dunes, what to do there and where to stay. 1.3 When is the park open? 2 How to get to the Dunes of Loon and Drunen? 3 Where to stay when visiting the Dunes of Loon and Drunen? 4 What to do in the Dunes of Loon and Drunen? 4.1 Go for a walk! 4.5 Sledge down a slope! 4.6 Take tons of photos! Standing on one of the sand dunes. Some of them get as high as 24 m, pretty high for a flat country like Holland! Originally, the area was a rugged sandy moorland. During the Middle Ages through overgrazing and peat extraction from the heathlands, the area got desolate and the exposed sand plains allowed for the sand to drift. There were even whole villages buried under the sand: Westloon and Efteling. Fun fact: Efteling is an amusement park near the Dunes of Loon and Drunen and is named after the medieval village that once disappeared under the drift sand. Read here everything about the park. Plantloon – located at the northern side of the national park, it used to be a country estate. It became part of the Dunes of Loon and Drunen national park in 1994. There are forests, meadows, lanes and even farms. The Galgenwiel is a quite unique part of the Plantloon – it developed in the 17th century after an overflow of the Meuse River. Today it’s a marsh area and a lovely place for a walk. Plantloon has distinctively an estate character with cute little farm houses. Walking there feels as if you are stepping back in time. In 1658 the dikes broke and the waters of the Meuse River flooded the area. Today, this is lovely place to have a short walk and enjoy the nature. Sand dunes – the sand is still alive in this area and is always in motion. This is pretty amazing if you visit the place a few times over the years – the dunes would have simply moved. The highest dunes are about 24 m. Well, it might look not that impressive to some of you, but if you’ve been staying for a longer period in the Netherlands and are accustomed to the flat landscape a dune of 24 m is pretty high. The first time I went to the park it had a really wow effect on me. De Brand – another reserve that has been later on included in the national park. It is located at the southern side of the Dunes and is a forest land with some meadows. In the 13th century the place was a large peatland. The Dunes of Loon and Drunen are offering such a great natural diversity, that you can easily spend there a week exploring the various areas. Get lost in this amazing national park in the Netherlands! Once this alley used to be a normal road, but today as a part of the National Park, there are no vehicles allowed there. De Brand is a border area to the sand dunes, which was made a part of the National Park. DISCLOSURE: This post contains affiliate links. If you book your stay via one of these links, I may earn a small commission at no extra cost for you. This is helping me to maintain the blog and pay for things like the hosting. Thank you for contributing to the existence of this blog! This is not a sponsored post and I have paid for all activities myself. All opinions, as always, are mine. This nature preserve is quite large with an area of more than 35 km2. There are 8 entry points to the national park. At each entry point, there’s a lovely café. Most of them have bikes for rent, some offer horse riding and horse carts, and a few have accommodation attached. You can also park at these entry points. Bosch & Duin – a café . Het Galgenwiel – a café and a restaurant. Here on the map you can see all entry points to the National Park together with the nearest by stops. For information on how to get to the Dunes of Loon and Drunen, scroll further down. The Dunes of Loon and Drunen National Park is open all year around. However visitors are not allowed in the park before sunrise and after sunset. There is no entry fee to the park. How to get to the Dunes of Loon and Drunen? The Dunes of Loon and Drunen are located in the Dutch province of North Brabant. Getting there by public transport can be a bit difficult, but not impossible. The best way to access this beautiful park is by car. Bus line 136 to Tilburg/Den Bosch (‘s-Hertogenbosch): get off at bus stop Akkerlaan in Waalwijk and walk towards the entry points De Roestelberg (45 minutes) or Het Genieten (40 minutes). Bus lines 136, 301 or 302 to TiIburg/Den Bosch (‘s-Hertogenbosch): get off at bus stop Overlaatweg in Waalwijk. It takes 5 minutes more to reach the entry points or get off at bus stop Horst in Kaatsheuvel and you’ll reach both entry points after 40 minutes. Bus lines 239 and 639 to Udenhout: get off at bus stop Gommelsestraat and the entry point De Rustende Jager is only at 20 minutes walking. All bus stops are indicated further in this guide on the map together with all entry points to the Dunes of Loon and Drunen. Find out here how to get to Den Bosch (‘s-Hertogenbosch). You can plan your trip by clicking on the Plan my journey button bellow. It will take you to the official site of the Dutch Public Transport Service. The Dunes of Loon and Drunen are easy to reach by car. It takes about hour and half from Amsterdam, so the Dunes are perfect for a day trip from Amsterdam, if you want to escape for a while the city and reconnect with nature. If you are already staying in Den Bosch, which I highly recommend, the nearest entry point (Giersbergen) is only a 25 minutes’ drive. If you are staying in Den Bosch (‘s-Hertogenbosch), then you need to read my city guide. As the national park is close to the Dutch-Belgian border, it takes a little bit over an hour to get there from Antwerp or an hour and 45 minutes from Brussels. All trails, whether for walking, or for biking, mountain biking or horse riding, in the Dunes are clearly marked. There are even special areas where dogs can be unleashed. Where to stay when visiting the Dunes of Loon and Drunen? Although you can visit the Dunes of Loon and Drunen only for a day, I would advise you to take a short break of a few days in the region. It’s perfect for a long weekend escape, if you are a nature lover. You can choose to stay in one of the surrounding big cities: Den Bosch (‘s-Hertogenbosch), Tilburg or Breda, or in the small towns and villages surrounding the park: Waalwijk, Sprang-Capelle, Kaatsheuvel, Drunen, Loon op Zand, Udenhout, or Helvoirt. There are also quite a lot of campings in the area. There is a vast choice of accommodation: from cute country-style bed and breakfasts to farm campings, from posh hotels to hip hostels. If you want to stay in the heart of the park, then you should consider some of the entry points that offer accommodation as well. What to do in the Dunes of Loon and Drunen? There are numerous walking trails starting at each of the entry points with different lengths. You don’t need to be very fit or have special equipment to embark on them. Just remember you will be walking in the sand, so be prepared to get sandy all over. If you are walking on a sunny day in the summer, make sure you always have water with you, otherwise you’ll feel like crossing Sahara without water. Also, be careful when crossing the mountain bike routes and do not use them as walking paths. It can be quite dangerous. At sunset the sand gets this burning orange colour! The Dunes of Loon and Drunen are a great place to watch the sunset! After the sun goes down you are expected to leave the park, as the park is open only from sunrise till sunset. Having extensive biking culture in the Netherlands, bikes aren’t missing even in the national parks. You can rent a bike at the entry points to the park (see above for more info), or at your accommodation, and explore the Dunes on a bike. However, there are special bike routes, so you can’t bike everywhere. This is a wonderful way to explore the whole park in a day. Do not forget to include the cafés at the entry points for refreshments and small breaks. Understandably, there aren’t many places in the Netherlands where you can go mountain biking, and the Dunes of Loon and Drunen are one of them, offering a great terrain over sandy slopes and through forests. There are special routes marked for mountain bikers. When biking in the Dunes watch out for people that are walking on the trails or crossing them. As the terrain is hilly, at some places you will see them at the very last moment and this can create dangerous situations. There are special horse riding trails in the park, so you can explore the nature preserve on the back of horse. I can’t give you a first-hand advice on that as I have never done it, but it looks fun. No, I don’t mean on the sand. On the rare occasions when it snows in the Netherlands, but it still happens at least once a year, the Dunes are great to go there with your sledge and go downhill the dunes. Well, it’s at least fun for the kids. This place is magic at sunset or dawn. In the winter, when the sand dunes are covered with snow, you can make amazing photos. For landscape photography that doesn’t look like being taken in the Netherlands – the Dunes are the right place. In the autumn when the heath is in bloom, the place gets a surreal pinkish-purple haze. The sand dunes at dusk are magical! The temperature of the air cools down quickly and the sand is still warm - then you have this haze that hovers above the sand. Giesrbergen is a tiny hamlet at the north-east side of the national park. There are a few old long facade farmhouses with thatched roofs, typical for North Brabant. Walking through the only street in Giersbergen brings you back in time, you can smell the peat burning in the chimneys, you can hear the yelling of the workers on the bogs, and you would almost walk over a goose and her goslings crossing the road. You can stop for a short break at the Drie Linden café. Fun fact: There are only 28 inhabitants in Giersbergen. I am so in love with those farmhouses with thatched roofs! And guess what - there are plenty of them in the Netherlands! the Peace Memorial on Eftelingsestraat in Kaatsheuvel. While researching for this post, I found a great article about the war history of the Dunes, but unfortunately it’s only in Dutch. So, if you speak Dutch and want to learn more about those events you can read the article War Monuments in the Dunes of Loon and Drunen National Park by Henk Peters. During the war the Germans had a munitions depot in the south-east part of the national park, which they blew on Mad Tuesday (5 September 1944) in the morning. There’s also a dedicated walking trail in the Dunes that will take you along bomb craters, trenches and latrines. The Dunes are still keeping one of the darkest secrets of WWII: the mass grave of the 14 members of the Dutch Resistance who were shot in one of the firing ranges there. Until today this secret remains covered by sand. When you walk through the park be careful, as munitions from WWII can still be found. In 2013 there was found even a grenade. The sun has just set behind the trees and the sand dunes transform into a magical place! Have you been to the Netherlands and have you visited one of the 20 National Parks? Share your experience with us below in the comments! LOVE learning about new places like this! Looks so beautiful – an amazing place for a proper forest walk, loved reading about all the history, thanks for sharing. De Brand looks like such a photographic place, such amazing trees.